the task-specific context menu can be called in several contexts: in Navigator, in To-Do list, in Followed list, as well as in the Search tab. Custom menu items added into the task-specific menu appear in all of listed above contexts. The attachment-specific context menu can be called in Forum alongside with the message-specific menu, and while searching the attachments. Custom menu items added into the attachment-specific menu appear in Forum and in attachment search window. 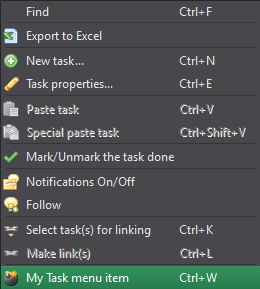 Message-specific context menu is called from a task Forum thread. Each menu item added should be tied to a function of a custom user’s module. Activation of the menu item calls the corresponding function. Besides, the custom user’s menu items can have graphic thumbnails and assigned hot key combinations. Custom user’s menus are added to the init_actions functions from menu module. Called on application start and on Python modules updating on debugging. You can find the examples of adding user’s menus here.